"Rouhani" redirects here. For other persons with this surname, see Rouhani (surname). "Rohani" redirects here. For the village in Iran, see Rohani, Iran. Hassan Rouhani (Persian: حسن روحانی‎, Standard Persian pronunciation: [hæˈsæne ɾowhɒːˈniː] ( listen); born Hassan Fereydoun (Persian: حسن فریدون‎) on 12 November 1948) is an Iranian politician serving as the current and seventh President of Iran since 3 August 2013. He was also a lawyer, academic, former diplomat and Islamic cleric. He has been a member of Iran's Assembly of Experts since 1999, member of the Expediency Council since 1991, and a member of the Supreme National Security Council since 1989. Rouhani was deputy speaker of the fourth and fifth terms of the Parliament of Iran (Majlis) and Secretary of the Supreme National Security Council from 1989 to 2005. In the latter capacity, he was the country's top negotiator with the EU three, UK, France, and Germany, on nuclear technology in Iran, and has also served as a Shi'ite ijtihadi cleric, and economic trade negotiator. :138 He has expressed official support for upholding the rights of ethnic and religious minorities. In 2013, he appointed former industries minister Eshaq Jahangiri as his first vice-president. On 7 May 2013, Rouhani registered for the presidential election that was held on 14 June 2013. He said that, if elected, he would prepare a "civil rights charter", restore the economy and improve rocky relations with Western nations. Rouhani is frequently described as a moderate. He was elected as President of Iran on 15 June, defeating Tehran mayor Mohammad Bagher Ghalibaf and four other candidates. He took office on 3 August 2013. In 2013, Time magazine named him in its list of the 100 Most Influential People in the World. In domestic policy, he encourages personal freedom and free access to information, has improved women's rights by appointing female foreign ministry spokespeople, and has been described as a centrist and reformist who has improved Iran's diplomatic relations with other countries through exchanging conciliatory letters. Rouhani won re-election in the 2017 election with 23,636,652 votes (57.1%). He became the third Iranian President, after Mohammad Khatami and Mahmoud Ahmadinejad, to win a presidential victory as an incumbent with an increased electoral mandate. His name is also spelled as Hasan Rouhani, Hassan Rohani, Hasan Rohani, Hassan Rowhani or Hasan Rowhani. He was born Hassan Fereydoun (or Fereydun, in reference to a just king in Persian mythology, Persian: ‌حسن فریدون‎, Persian pronunciation: [hæˌsæn-e feɾejˈdun]) and later changed his last name to Rouhani, which means 'spiritual' or 'cleric'; also transliterated as Rowhani, Ruhani, or Rohani). It is not clear when he officially changed his last name. He was named as "Hassan Fereydoun Rouhani" (Persian: حسن فریدون روحانی‎) in a list of Majlis representatives on 5 July 1981, while photos of his identification card (in Persian transliteration: shenasnameh) taken around his presidential campaign in 2013 only mention "Rouhani" as his last name. 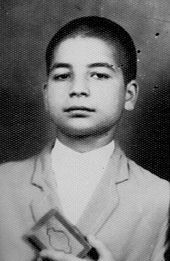 Hassan Rouhani (born Hassan Fereydoun) was born on 12 November 1948 in Sorkheh, near Semnan, into a religious Persian family. His father, Haj Asadollah Fereydoun (died 2011), had a spice shop in Sorkheh and his mother lived in Semnan until her death in 2015 with her daughters and sons-in-law. Asadollah Fereydoun is reported to have been politically active against Mohammad Reza Shah Pahlavi, the Shah of Iran, and arrested first in 1962, and then more than twenty times before the Iranian Revolution in 1979. Rouhani started religious studies in 1960, first at Semnan Seminary:55 before moving on to the Qom Seminary in 1961.:76 He attended classes taught by prominent scholars of that time including Mostafa Mohaghegh Damad, Morteza Haeri Yazdi, Mohammad-Reza Golpaygani, Soltani, Mohammad Fazel Lankarani, and Mohammad Shahabadi. :81 In addition, he studied modern courses, and was admitted to the University of Tehran in 1969, and obtained a BA degree in Judicial Law in 1972.:309–312 In 1973, Rouhani entered military service in the city of Nishapur. Rouhani continued his studies at Glasgow Caledonian University in Scotland, graduating in 1995 with an M.Phil. degree in Law with his thesis entitled The Islamic legislative power with reference to the Iranian experience and a PhD degree in Constitutional Law in 1999 for a thesis titled The Flexibility of Shariah (Islamic Law) with reference to the Iranian experience. Rouhani's Caledonian research was initially supervised by Iranian lawyer and scholar Professor Sayed Hassan Amin and later by Islamic law scholar Dr Mahdi Zahraa. The website of the Center for Strategic Research, a think-tank headed by Rouhani, misattributed his PhD to Glasgow University rather than Glasgow Caledonian University and confusion ensued as a result on whether he was a graduate of either university, especially as he was known during his student years by his birth name "Hassan Fereydoun". Glasgow Caledonian University carried out an internal investigation to confirm Rouhani's alumnus status and after confirming it, it published Rouhani's theses abstracts and a video showing him being capped, as Scottish academic tradition provides, during the University's 1999 graduation ceremony. Allegations regarding Rouhani's plagiarism were first raised in 2013 when it was claimed that he had probably "lifted" sentences from a book by Afghan author Mohammad Hashim Kamali. Glasgow Caledonian University, Rouhani's graduation school, argued that the sentences were both cited properly. The issue was raised again amid 2017 Iranian presidential election when a student campaign claimed that they had for the first time investigated Rouhani's whole thesis using plagiarism detection tool iThenticate and that chapters one through four of Rouhani’s thesis had been plagiarized at least 39%, 43%, 40% and 82%, respectively. Ayatollah Ali Akbar Kalantari, a member of Assembly of Experts, Shiraz University faculty member and one of the alleged victims, said that "major segments" of Chapter 4 of Rouhani's thesis had been translated from his book without being referenced. Reformist Sadegh Zibakalam accused Rouhani's rival of politicizing the case right before the elections. Mohammad Mehdi Zahedi, head of Iranian Parliament's Commission on Education and Research, said that he had found major plagiarisms in chapter 4 of Rouhani's thesis and that the case would be investigated in Education and Research Commission. 50 student-run organizations as well as Shiraz University faculty professors asked Ali Akbar Kalantari to prosecute the case in separate letters. In November 1977, during a public ceremony held at Tehran's Ark Mosque to commemorate the death of Mostafa Khomeini (the elder son of the Ayatollah Khomeini), Rouhani used the title "Imam" for the Ayatollah Khomeini, the then exiled leader of the Islamist movement, for the first time. :375 It has been suggested that the title has been used for Khomeini by others before, including by the Grand Ayatollah Mohammad Baqir al-Sadr, although Rouhani was influential in publicizing the title. Following the 1979 Iranian Revolution, Rouhani, who had been engaged in revolutionary struggles for about two decades, did his best to stabilize the nascent Islamic Republic and as a first step, he started with organizing the disorderly Iranian army and military bases. :515 He was elected to the Majlis, the Parliament of Iran, in 1980. During five terms in the Majlis and for a total of 20 years (from 1980 to 2000), he served in various capacities including deputy speaker of the Majlis (in 4th and 5th terms), as well as the head of defense committee (1st and 2nd terms), and foreign policy committee (4th and 5th terms). Among responsibilities shouldered by him in the post-revolution era was leadership of the supervisory council of the Islamic Republic of Iran Broadcasting (IRIB) from 1980 to 1983. In July 1983, while Rouhani was heading the council, the council members and Rouhani had conflicts with Mohammad Hashemi Rafsanjani the then head of IRIB, which led to temporary replacement of Hashemi by first Rouhani and then immediately Mohammad Javad Larijani. The conflict was resolved by the Ayatollah Khomeini intervening and insisting on Rafsanjani staying as the head of IRIB. During the Iran–Iraq War, Rouhani was a member of the Supreme Defense Council (1982–1988), member of the High Council for Supporting War and headed its Executive Committee (1986–1988), deputy commander of the war (1983–1985), commander of the Khatam-ol-Anbiya Operation Center (1985–1988), and commander of the Iran Air Defense Force (1986–1991). He was appointed as Deputy to Second-in-Command of Iran's Joint Chiefs of Staff (1988–1989). When Robert C. McFarlane, Reagan's national security adviser, came to Tehran in May 1986, Rouhani was one of the three people who talked to McFarlane about buying weapons. Eventually, this weapons sale became known as the Iran–Contra affair. At the end of the war, Hassan Rouhani was awarded the second-grade Fath (Victory) Medal along with a group of commanders of the Iranian Army and the Revolutionary Guards. In another ceremony on the occasion of the liberation of Khoramshahr, he and a group of other officials and military commanders who were involved in the war with Iraq were awarded first-grade Nasr Medal by the Commander-in-Chief of the Armed Forces Ayatollah Khamenei. Rouhani was offered and turned down the post of Minister of Intelligence of Iran in 1989. After the Constitution of the Islamic Republic of Iran was amended and the Supreme National Security Council (SNSC) came into being up to the present time, he has been representative of the Supreme Leader, Ayatollah Khamenei, at the council. Rouhani was the first secretary of the SNSC and kept the post for 16 years from 1989 to 2005. He was also national security advisor – to President Hashemi and President Khatami – for 13 years from 1989 to 1997 and from 2000 to 2005. In 1991, Rouhani was appointed to the Expediency Council and has kept that post up to the present time. He heads the Political, Defense, and Security Committee of the Expediency Council. After the Iran student protests, July 1999 he, as secretary of Supreme National Security Council, stated in a pro-government rally that "At dusk yesterday we received a decisive revolutionary order to crush mercilessly and monumentally any move of these opportunist elements wherever it may occur. From today our people shall witness how in the arena our law enforcement force . . . shall deal with these opportunists and riotous elements, if they simply dare to show their faces." and led the crackdown. In the midterm elections for the third term of the Assembly of Experts which was held on 18 February 2000, Rouhani was elected to the Assembly of Experts from Semnan Province. He was elected as Tehran Province's representative to the Assembly's fourth term in 2006 and is still serving in that capacity. He was the head of the political and social committee of the assembly of experts (from 2001 to 2006), member of the presiding board, and head of Tehran office of the secretariat of the assembly (from 2006 to 2008). On 5 March 2013, he was elected as a member of the Assembly's "Commission for investigating ways of protecting and guarding Velayat-e Faqih". In addition to executive posts, Rouhani kept up his academic activities. From 1995 to 1999, he was a member of the board of trustees of Tehran Universities and North Region. Rouhani has been running the Center for Strategic Research since 1991. He is the managing editor of three academic and research quarterlies in Persian and English, which include Rahbord (Strategy), Foreign Relations, and the Iranian Review of Foreign Affairs. As tensions increased and in view of the existing differences between Iran's Ministry of Foreign Affairs and Atomic Energy Organization, a proposal was put forth by the foreign minister, Kamal Kharazi, which was accepted by the president and other Iranian leaders. According to that proposal, a decision was made to establish a politically, legally, and technically efficient nuclear team with Hassan Rouhani in charge. The team was delegated with special powers in order to formulate a comprehensive plan for Iran's interactions with the IAEA and coordination among various concerned organizations inside the country. Therefore, on the order of President Khatami with the confirmation of Ali Khamenei, Hassan Rouhani took charge of Iran's nuclear case on 6 October 2003.:138–140 Subsequently, negotiations between Iran and three European states started at Saadabad in Tehran and continued in later months in Brussels, Geneva and Paris. Rouhani and his team, whose members had been introduced by Velayati and Kharazi as the best diplomats in the Iranian Foreign Ministry,:109,141 based their efforts on dialogue and confidence building due to political and security conditions. As a first step, they prevented further escalation of accusations against Iran in order to prevent reporting Iran's nuclear case to the United Nations Security Council. Therefore, and for the purpose of confidence building, certain parts of Iran's nuclear activities were voluntarily suspended at several junctures. In addition to building confidence, insisting on Iran's rights, reducing international pressures and the possibility of war, and preventing Iran's case from being reported to the UN Security Council, Iran succeeded in completing its nuclear fuel cycle and took groundbreaking steps. :660–667 However, decisions made by the nuclear team under the leadership of Rouhani were criticized by certain circles in later years. Following the election of Mahmoud Ahmadinejad as president, Rouhani resigned his post as secretary of the Supreme National Security Council after 16 years on 15 August 2005,:594,601 and was succeeded by Ali Larijani as the new secretary who also took charge of Iran's nuclear case. Larijani, likewise, could not get along with the policies of the new government and resigned his post on 20 October 2007, to be replaced by Saeed Jalili. Rouhani then was appointed by the Supreme Leader as his representative at the SNSC. Our centrifuges are good to spin when our people's economy is also spinning in the right direction. Rouhani was considered a leading candidate in the June election because of his centrist views yet close ties to Iran's ruling clerics and the Green Movement. He announced his presidential candidacy on 11 March 2013 and registered as a presidential candidate on 7 May. Amid the run-up to the election, former presidents Mohammad Khatami and Akbar Hashemi Rafsanjani, together with reformists supported Rouhani on the presidential race after pro-reform candidate Mohammad Reza Aref dropped out of the presidential race after Khatami advised him to quit in favor of Rouhani. On 10 June, Mehr news agency and Fars news agency, suggested that Rouhani might be disqualified prior to the election and The Washington Post, in an editorial, predicted that Rouhani "will not be allowed to win". On 15 June 2013, Interior Minister Mostafa Mohammad Najjar announced the results of the election, with a total number of 36,704,156 ballots cast; Rouhani won 18,613,329 votes, while his main rival Mohammad Bagher Ghalibaf secured 6,077,292 votes. Rouhani performed well with both the middle class and youth, even garnering majority support in religious cities such as Mashhad and Qom (an important seat of Shia Islam and the clergy, many of whom surprisingly do not support conservatives) as well as small towns and villages. Rouhani's electoral landslide victory was widely seen as the result of the Green Movement from the 2009 elections, with crowds chanting pro-reform slogans. Religious Iranians equally celebrated Rouhani's victory, demonstrating what analysts described as a thorough rejection of the policies of the conservative factions. Rouhani saw off a strong challenge from hardline Ebrahim Raisi at the 2017 election, a fellow cleric with radically different politics, who stirred up populist concerns about the sluggish economy, lambasted Rouhani for seeking foreign investment and appealed to religious conservatives. He had gathered momentum as conservatives keen to win back control of the government coalesced behind Raisi's initially lacklustre campaign. His other rivals were Mostafa Mir-Salim and Mostafa Hashemitaba. Rouhani ultimately won the election in a landslide, providing a ringing endorsement of his efforts to re-engage with the West and offer greater freedoms. He received 23,636,652 of the votes, in an election that had 73.07% turnout. In his press conference one day after election day, Rouhani reiterated his promise to recalibrate Iran's relations with the world. He promised greater openness and to repair the country's international standing, offering greater nuclear transparency in order to restore international trust. Revolutionary Guards Major General Mohammad Jafari criticised Rouhani's administration. "The military, systems and procedures governing the administrative system of the country are the same as before, [but it] has been slightly modified and unfortunately infected by Western doctrine, and a fundamental change must occur. The main threat to the revolution is in the political arena and the Guards cannot remain silent in the face of that." In May 2017, Rouhani was re-elected as President with 23.5 million votes. He was announced the winner on the day following the election. He received his presidential precept from his predecessor, Mahmoud Ahmadinejad on 3 August 2013 and entered Sa'dabad Palace in a private ceremony. His work as president officially began on the same day at 17:00 IRDT. He was inaugurated as the seventh president of Iran on 4 August in House of the Parliament. Rouhani announced his cabinet on 4 August. He had a ten-day mandate for introducing his cabinet members to the parliament but he did not use this. Then, parliament voted on his cabinet, which was scheduled on 14–19 August. Between three reformist politicians (Mohammad Reza Aref, Eshaq Jahangiri or Mohammad Shariatmadari) that were likely for the vice presidency, Rouhani appointed Jahangiri for the position. There were also many candidates for ministry of foreign affairs: Ali Akbar Salehi, Kamal Kharazi, Sadegh Kharazi, Mohammad Javad Zarif and Mahmoud Vaezi but Zarif became Rouhani's final nominee. Although several names were being circulated for the other ministerial posts before the final announcement, the office of president-elect denied these speculations. On 23 July 2013, it was reported that eight members of Rouhani's cabinet had been finalized: Jahangiri as first vice president, Zarif as foreign minister, Rahmani Fazli as interior minister, Tayebnia as finance minister, Dehghan as defense minister, Namdar Zanganeh as petroleum minister, Najafi as education minister, Chitchian as energy minister, Nematzadeh as industries minister, Hassan Hashemi as health minister and Akhondi as transportation minister. This become official after Rouhani presented the list of his ministry nominates to the parliament on his inauguration day. He also appointed Mohammad Nahavandian as his chief of staff. The economic policy of Hassan Rouhani focuses on the long-term economic development of Iran. It deals with increasing the purchasing power of the public, economic growth, raising sufficient funds, implementation of the general policies of 44th Principle of the Constitution of the Islamic Republic of Iran and improving the business environment in the short term. Rouhani believes that improving the economic conditions of the people should be accomplished by boosting the purchasing power of the people, reducing the wealth gap. He also thinks that equitable distribution of national wealth and economic growth lead to all mentioned economic goals. He states that if national wealth was not created, poverty would be distributed. National wealth creation causes an increase in real income per capita and equitable distribution of wealth. His plan is targeted to increase direct and indirect assistance to low-income groups. Rouhani is urgently going to regenerate the Management and Planning Organization of Iran. His economic policies also comprise optimal distribution of subsidies, control of liquidity and inflation, speeding economic growth and reducing import. He believes that inflation results in damaging effects on the economy of families and hopes to deflate that in Foresight and Hope Cabinet. Rouhani plans urgent economic priorities such as control of high inflation, increasing purchasing power and cutting down high unemployment. According to a March 2014 report by Center for International Media Assistance, since Rouhani takeover in 2013, "Censorship of the Internet has only gotten worse, but it's more and more clear that Rouhani does not have complete control over this process". Regarding internet censorship, he has stated: "Gone are the days when a wall could be built around the country. Today there are no more walls." He has also criticized Islamic Republic of Iran Broadcasting for showing trivial foreign news, while ignoring pressing national matters. Rouhani also appeared to pledge his support for increasing Internet access and other political and social freedoms. In an interview, he said: "We want the people, in their private lives, to be completely free, and in today’s world having access to information and the right of free dialogue, and the right to think freely, is the right of all peoples, including the people of Iran." Rouhani has maintained a policy of not publicly addressing human rights issues, on which he may have limited powers. There must be equal opportunities for women. There is no difference between man and woman in their creation, in their humanity, in their pursuit of knowledge, in their understanding, in their intelligence, in their religious piety, in serving God and in serving people. Rouhani's government appointed Elham Aminzadeh, Shahindokht Molaverdi and Masoumeh Ebtekar as vice presidents; as well as Marzieh Afkham, the first female spokesperson for the foreign ministry. Rouhani has promised to set up a ministry for women. Many women's rights activists, however, are reluctant about a ministry for women; because they feel that this ministry may isolate women's issues. It has also been suggested that Rouhani will require a deputy minister position within each ministry to address gender issues and issues pertaining to women. In September 2013, eleven political prisoners were freed including noted human rights lawyer Nasrin Sotoudeh and Mohsen Aminzadeh. The move came just days before his visit to the United States for the United Nations General Assembly. Critics say that little has changed in domestic policy since Rouhani took office. Iranian authorities executed 599 people during Rouhani's first 14 months in power, compared with 596 during the last year in office of his predecessor, Mahmoud Ahmadinejad. Iran has the highest number of executions anywhere in the world, apart from China. Nobel Peace Prize winner Shirin Ebadi has criticized Rouhani's human rights record. She cited the increase in executions, Abdolfattah Soltani's hunger strike, and the continued house arrest of Mir Hossein Mousavi and Mahdi Karroubi. An Iranian spokesperson said Ebadi's comments would end up provoking animosity towards Iran. In 2015, Rouhani appointed Marzieh Afkham and Saleh Adibi, as the first female since the 1979 (the second in history) and the first Sunni Kurd respectively, to hold office as ambassadors. Rouhani's foreign policy has been contained by the conservatism of Iranian Principlists, who fear change, while also realizing it is necessary. Furthermore, Iran's foreign policy, which was deadlocked by the efforts of Mahmoud Ahmadinejad, needs new predecessor by cautious and decisive efforts of Rouhani. [clarification needed] The main task of Rouhani is only to develop dialogues between Iran and Political rivals including P5+1. This course can help lift sanctions that damaged the Iranian economy. In March 2015, Rouhani sent a letter to President Obama and the heads of the other five countries negotiating with Iran, explaining Iran's stance. He announced it on his Twitter account. The US National Security Council confirmed that the letter had been passed on to the U.S. negotiating team, but its contents were not released. Rouhani also spoke by phone with the leaders of all the nations involved in the negotiations, except for the United States. Rouhani met with British Prime Minister David Cameron, marking the first time since the 1979 Islamic revolution that the leaders of Iran and the United Kingdom have met. On 20 February 2014 the Iranian Embassy in London was restored and the two countries agreed to restart diplomatic relations. On 23 August 2015 the embassy was officially reopened. Rouhani's visit to New York City in September 2013 was hailed[who?] as major progress in Iran's relations with the United States. He previously said that his government is ready to hold talks with the United States after thirty-two years. Rouhani denied reports that during his trip he had refused a meeting with U.S. President Barack Obama, and felt more time was needed to coordinate such a meeting. On 27 September 2013, a day after the two countries foreign ministers met during the P5+1 and Iran talks, Rouhani had a phone call with President Obama that marked two countries' highest political exchange since 1979. However, due to this phone call Rouhani was protested by conservatives who chanted "death to America" when he returned to Tehran. In February 2019, Rouhani condemned the United States for trying to topple Iran’s ally, Venezuelan President Nicolás Maduro. It is generally assumed that he will follow the ruling establishment in completely supporting Bashar al-Assad, Syria's contentious president, in the Syrian Civil War, as well as "strengthening the Shia Crescent" that runs from southern Lebanon, through Syria, Iraq and into Iran. In his first press conference after winning the presidential election, Rouhani said that "the ultimate responsibility to resolve the Syrian civil war should be in the hands of the Syrian people." Rouhani has termed Iran–Iraq relations "brotherly" and signed several agreements with Iraq. Right after the Northern Iraq offensive, Iran was the first country to send support for Iraq and is a "key player" in Military intervention against the ISIL. there was a consensus [during Khatami's administration] that we should have good relations with Saudi Arabia. No one within the nezaam [regime] was opposed to it. I went to Saudi Arabia for the first time in 1998. At that time Saudi Arabia had accused us of involvement in the Khobar Towers bombing. I went to Saudi Arabia as the secretary-general of the SNSC. From their side, [Minister of Interior] Nayef bin Abdulaziz took part in the negotiations. The negotiations began at 10 p.m. and lasted until 5 a.m. the next morning. We finally agreed on a security agreement. I returned to Saudi Arabia in [early] 2005, and had extensive discussions about the region, mutual problems between us, and the nuclear issue. We agreed with Nayef to form four committees. They were supposed to convene every few months and pursue the issues. After I left [the post of] secretary-general, none of the committees were formed and there were no meetings. Rouhani has criticized Saudi Arabian-led military intervention in Yemen, saying: "Don't bomb children, elderly men and women in Yemen. Attacking the oppressed will bring disgrace." Rouhani describes Israel as "an occupier and usurper government" that "does injustice to the people of the region, and has brought instability to the region, with its warmongering policies." When asked to clarify his opinion about the Holocaust, Rouhani replied: "... in general, I can tell you that any crime that happens in history against humanity, including the crime the Nazis created towards the Jews as well as non-Jews is reprehensible and condemnable. Whatever criminality they committed against the Jews, we condemn". In an interview with CNN, it was claimed by the CNN translator that Rouhani had acknowledged the existence of the Holocaust, however CNN's statements were accused by Iranian state media as a fabrication created by a deliberate mistranslation by CNN. Other sources, such as the Wall Street Journal, argued that their independent translators corroborated Iranian media's position, and described CNN's translation as highly inaccurate, having added to their translation many words (such as 'holocaust') that he had not said. In November 2018, Rouhani called Israel a "cancerous tumor established by Western countries to advance their interests in the Middle East." According to a poll conducted in March 2016 by Information and Public Opinion Solutions LLC (iPOS) among Iranian citizens, Rouhani has 75% approval and 12% disapproval ratings and thus a +54% net popularity, making him the second most popular politician in Iran, after Mohammad Javad Zarif with +69% net popularity. Rouhani surpasses Hassan Khomeini (+52%), Mohammad Khatami (+43%) and Akbar Hashemi Rafsanjani (+38%) who take the following places. The firm states with 95% confidence that the margin of sampling error is ±3 percentage points. Rouhani began his presidency in November 2013 with approval and disapproval ratings near 58% and 27% respectively, according to Information and Public Opinion Solutions LLC (iPOS) which is assessing it on a quarterly basis. It gradually fell down to 48% and he recorded a 33% disapproval rating in May 2015. His job approval boosted after Joint Comprehensive Plan of Action, according to the survey conducted by IranPoll for the University of Maryland's Center for International and Security Studies (CISSM), standing on 88% with a large majority (61%) expressing a "very favorable view" of him (up from 51% in July 2014) and a ±3.2 margin of sampling error. The poll also indicated Rouhani has a "tough challenge" in maintaining the support due to the fact that people have high economic expectations from the deal, and it could become his Achilles' heel. iPOS has recorded a 54% approval and 24% disapproval, days after the deal in August 2015. The trend has continued until February 2016, with 67% and 18% approval and disapproval ratings, marking the highest level since he took office. Rouhani is considered to be a moderate and pragmatic politician. In 2000, the Washington Institute for Near East Policy described him as "power-hungry". He was elected as president with heavy reformist support, and he pledged to follow through with reformist demands and to bridge divides between reformists and conservatives. During the 2017 presidential election, Rouhani's views moved more to the left and he fully aligned with the reformist faction. Rouhani surrounded by his family at his father's funeral, Noor mosque, Tehran on 5 October 2011 . Rouhani married his cousin, Sahebeh Erabi (Rouhani), who is six years younger, when he was around 20 years old and has four children (one son and three daughters). Rouhani's wife changed her last name from "Еrabi" (Persian: عربی‎) to "Rouhani" some time after marriage. Born in 1954, she is not politically active. The Guardian and the Financial Times reported that Rouhani also had a fifth child, a son who has died in unknown circumstances. Based on a comment by Alireza Nourizadeh, some sources reported that he committed suicide "in protest of his father's close connection with Supreme Leader Ali Khamenei". This claim, apparently originating from Nourizadeh's report in the Saudi-owned newspaper Asharq Al-Awsat, included the following text which allegedly came from the son's suicide note: "I hate your government, your lies, your corruption, your religion, your double standard and your hypocrisy...I was forced to lie to my friends each day, telling them that my father isn't part of all of this. Telling them my father loves this nation, whereas I believe this to be untrue. It makes me sick seeing you, my father, kiss the hand of Khamenei." Rouhani has three sisters and a brother. Rouhani's brother, Hossein Fereydoun, is also a diplomat and politician, a former governor, ambassador, and former Vice Minister of Intelligence. He was Rouhani's representative to IRIB in arrangements for presidential debates.Akbar Hashemi Rafsanjani, in a memoir dated 15 May 1982, mentions Hossein Fereydoun as the then governor of Karaj. Rafsanjani later briefly mentions Fereydoon in a memoir dated 31 March 1984: "In Karaj, something has happened about Mr. Ferydoon Rouhani". ^ Mohammadighalehtaki, Ariabarzan (2012). Organisational Change in Political Parties in Iran after the Islamic Revolution of 1979. With Special Reference to the Islamic Republic Party (IRP) and the Islamic Iran Participation Front Party (Mosharekat) (Ph.D. thesis). Durham University. p. 175–177. ^ a b c d e f g h i j k l m "Hassan Rouhani's Résumé". CSR. 11 April 2013. Archived from the original on 15 May 2013. ^ Poursafa, Mahdi (20 January 2014). گزارش فارس از تاریخچۀ نشان‌های نظامی ایران، از «اقدس» تا «فتح»؛ مدال‌هایی که بر سینۀ سرداران ایرانی نشسته‌است [From "Aghdas" to "Fath": Medals resting on the chest of Iranian Serdars]. Fars News (in Persian). Retrieved 21 October 2014. ^ a b c d نکته‌هایی جالب در شناسنامۀ روحانی + عکس [Interesting points in Rouhani's ID + photo]. Shoma News (in Persian). Archived from the original on 27 September 2013. Retrieved 15 June 2013. ^ a b c d e f g h i j Rouhani, Hassan (2008). Memoirs of Hassan Rouhani; Vol. 1: The Islamic Revolution (in Persian). Tehran, Iran: Center for Strategic Research. ISBN 978-600-5914-80-1. ^ "Members of Assembly of Experts". Assembly of Experts. Retrieved 22 April 2013. ^ "Two new members appointed to the Expediency Discernment Council". The Office of the Supreme Leader. 8 May 1991. ^ "Hassan Rouhani appointed as the Supreme Leader's representative to the SNSC". The Office of the Supreme Leader. 13 November 1989. ^ Elham Pourmohammadi (15 March 2014). "Rouhani moots regional trade bloc to boost growth, stability". Times of Oman. Archived from the original on 22 March 2014. Retrieved 1 April 2014. ^ a b c d e f Rouhani, Hassan (2011). National Security and Nuclear Diplomacy (in Persian). Tehran, Iran: Center for Strategic Research. ISBN 978-600-290-007-4. ^ "Rouhani's Election: A Victory for the Green Movement?". Fair Observer°. 26 June 2013. Retrieved 1 April 2014. ^ "Rohani appoints Jahangiri as Iran's first vice president". Press TV. 5 August 2013. Archived from the original on 12 December 2013. Retrieved 1 April 2014. ^ "Iran's former nuclear negotiator registers for presidential campaign". People's Daily. 7 May 2013. ^ "Former nuclear negotiator joins Iran's presidential race". Reuters. 11 April 2013. 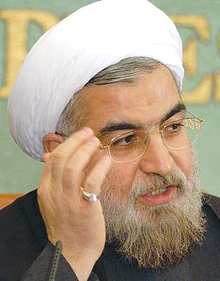 ^ "Expediency Council member Rohani to run for president". Press TV. 11 April 2013. ^ a b c d Fassihi, Farnaz. "Moderate cleric Hassan Rohani wins Iran Vote". The Wall Street Journal. ^ Farnaz Fassihi (15 June 2013). "Moderate Candidate Wins Iran's Presidential Vote". The Wall Street Journal. Retrieved 16 June 2013. ^ "Hassan Rouhani takes over as Iran president". BBC News. 3 August 2013. Retrieved 3 August 2013. ^ a b "Final results of presidential election by province and county" (in Persian). Ministry of Interior. 8 June 2017. Retrieved 8 June 2017. ^ Sadri Afshar, G. H.; Hakami, Nasrin; Hakami, Nastaran, eds. (2002). فَرهَنگِ مُعاصِرِ فارسی [Farhang Moaser Contemporary Persian Dictionary] (in Persian) (4th ed.). Tehran: Farhang Moaser Publishers. p. 679. ISBN 964-5545-68-4. ^ مجلس شورای اسلامی، دورۀ ۱، جلسۀ ۱۷۴ (in Persian). 5 July 1981. Archived from the original on 26 September 2013. ^ a b c "Q&A – Former Iran Nuclear Negotiator: Bush Negotiation Bid Was Rebuffed". PBS. 12 May 2012. Retrieved 31 July 2013. ^ مراسم ختم پدرِ حسن روحانی برگزار شد. ISNA (in Persian). 5 October 2011. ^ a b یک روز در زادگاه و خانۀ پدریِ حسن روحانی/تصاویر. Mehr Magazine (in Persian). 17 July 2013. Archived from the original on 4 August 2013. ^ a b c مادر دکتر حسن‌ روحانی از فرزندش می‌گوید/ عکس [The mother of Dr Hassan Rouhani talks about his child/Photo]. Mehr Magazine (in Persian). 19 June 2013. Archived from the original on 5 August 2013. ^ حاج اسدالله فریدون، پدر دکتر روحانی به دیار باقی شتافت. Aftab News (in Persian). 2 October 2011. ^ "مشرق نیور". GCU. 17 June 2013. ^ "GCU congratulates alumnus Hassan Rouhani on his election as the next President of Iran". GCU University News and Events. 19 June 2013. Archived from the original on 21 March 2015. ^ "alumnus Hassan Feridon". GCU lost alumni database. 18 June 2013. Archived from the original on 22 June 2013. ^ "GCU Alumnus to be next President of Iran". GCU. 17 June 2013. ^ "Website Sheds Light on Iran Elections Process, Players". Radio Free Europe/Radio Liberty. 10 June 2013. Retrieved 3 November 2013. ^ "Hassan Rouhani PhD & MPhil | Library Matters". Caledonianblogs.net. 19 June 2013. Archived from the original on 25 October 2013. Retrieved 3 November 2013. ^ a b Sadeghi, Fereshteh (17 May 2017). "Who's behind campaign to probe Rouhani's doctoral thesis?". Al-Monitor. Archived from the original on 3 August 2017. Retrieved 25 May 2017. ^ "Letter of Student Basij of 3 major universities in Tehran to Ayatollah Kalantari". Student News Network (in Persian). 19 July 2017. Archived from the original on 10 October 2017. Retrieved 8 September 2017. ^ "Weird response by a member of Article 90 Commission". 28 August 2017. Retrieved 8 September 2017. ^ استفاده از لفظ "امام" برای رهبر كبير انقلاب: ساواک قبل از حسن روحاني. Tabnak (in Persian). 23 October 2007. ^ آیت‌الله خمینی چگونه به امام خمینی ملقب شد؟ [How was Ayatollah Khomeini named Imam Khomeini?]. Jamaran (in Persian). 4 February 2012. ^ Rahim Nikbakht (4 June 2013). عنوان "امام" برای امام خمینی برای بار اول توسط ساواک به‌کار رفته‌است [The title "Imam" for Imam Khomeini was first used by SAVAK] (in Persian). The Majlis Library, Museum, and Archive. Archived from the original on 17 June 2013. ^ Akbar Hashemi Rafsanjani (22 July 1983). پیام رئیس‌جمهور کرۀ جنوبی به هاشمی/ گزارش دکتر روحانی از اختلافش با محمد هاشمی. آرامش و چالش (in Persian). ^ Akbar Hashemi Rafsanjani (21 July 1983). نظر هاشمی دربارۀ بازجویی سپاه از نمایندگان اقلیت مجلس/ عصبانیت امام از پخش خبر استعفای محمد هاشمی. آرامش و چالش (in Persian). Archived from the original on 17 June 2013. ^ Akbar Hashemi Rafsanjani (23 July 1983). "جزوۀ اِخوان‌المسلمین برای هاشمی/ سرپرستی جواد لاریجانی بر صداوسیما چگونه لغو شد؟". آرامش و چالش. ^ "The IRGC Strategic Brain Trust; Part 1: Ghasem Soleimani and Ahmad Vahidi". PBS. August 2012. Retrieved 25 July 2013. ^ "Whebn Rouhani met Ollie North". Foreignpolicy.com. Retrieved 3 November 2013. ^ Akbar Hashemi Rafsanjani (8 August 1989). گلایۀ هاشمی از اظهارنظر خودسرانۀ معاون وزیر خارجه/ نمودار سازمانیِ محمد هاشمی برای نهاد ریاست‌جمهوری. بازسازی و سازندگی (in Persian). دکتر [حسن] روحانی آمد. مشکلات وزارت اطلاعات را گفت و اظهار عدم تمایل برای این سمت کرد؛ اصرار نکردم. ^ Tait, Robert (14 June 2013). "Iran election: reports of late surge for more moderate candidate Hassan Rowhani". The Telegraph. London. ^ "Behind Iran's 'Moderate' New Leader". The Wall Street Journal. 16 June 2013. ^ اعضاى كمیسیون بررسى راه‌هاى پاسدارى و حراست از ولایت فقیه (in Persian). The Secretariat of the Assembly of Experts. 5 March 2013. ^ "Former Chief Nuclear Negotiator Criticizes Ahmadinejad". Iran Pulse. 15 October 2012. Archived from the original on 10 October 2017. Retrieved 19 April 2013. ^ "Iran's Former Nuclear Negotiator Slams Ahmadinejad, Calls Him 'Demagogue'". Fox News Channel. 5 June 2009. Retrieved 19 April 2013. ^ Board, Editorial (12 June 2013). "Iran votes Friday on a president, but the ballot is quite limited". The Washington Post. ^ "Presidential candidate Rouhani says will form inclusive administration". Press TV. 4 June 2013. Retrieved 15 June 2013. ^ Torbati, Yeganeh (11 June 2013). "Khatami, reformists back Rohani in Iran presidential vote". Reuters. Retrieved 15 June 2013. ^ "Iranian presidential candidate Rouhani might get disqualified prior to elections". Trend. Retrieved 18 June 2013. ^ Editorial Board (13 June 2013). "Iran votes Friday on a president, but the ballot is quite limited". The Washington Post. Retrieved 18 June 2013. ^ "Hassan Rouhani leads Iran presidential election vote count". BBC News. 15 June 2013. ^ "Rouhani Wins Iran's Presidential Election". Fars News Agency. Archived from the original on 19 June 2013. Retrieved 15 June 2013. ^ "Iran's Qom: Mystery and Surprise At the Hawza". Al-Monitor. 3 February 2009. Archived from the original on 29 October 2013. Retrieved 3 November 2013. ^ "Iran: Hassan Rouhani set for landslide in huge victory for reformists". 20 May 2017. ^ Solana, Javier (20 June 2013). "The Iranian Message". Project Syndicate. Retrieved 5 November 2013. ^ "Iran: President Hassan Rouhani wins re-election". euronews. 20 May 2017. Retrieved 22 May 2017. ^ "Iranian President Rouhani takes oath of office before parliament". Reuters. 4 August 2013. Retrieved 4 August 2013. ^ رونمایی از کابینۀ احتمالی دولت یازدهم. Bolanda News (in Persian). Archived from the original on 20 June 2013. ^ "هشت نفر از اعضای کابینۀ روحانی نهایی شدند +اسامی Iran Elections". Iranelect.ir. Archived from the original on 23 July 2013. Retrieved 3 November 2013. ^ "Improvement of people's livelihood". Rouhani[Persian Language]. Archived from the original on 13 July 2013. Retrieved 30 June 2013. ^ "The main topics of Rouhani economic programs". Raja News. Retrieved 30 June 2013. ^ "inflation". Official website. Archived from the original on 13 July 2013. Retrieved 30 June 2013. ^ "Hassan Rouhani's election as Iranian president to soften dialogue between Iran and West". Penza News. Retrieved 30 June 2013. ^ "Iran's new president: Smoother operator". The Economist. 3 August 2013. Retrieved 3 November 2013. ^ "Iran president blames Israel for 'instability,' calls for peace". NBC News. 19 September 2013. Retrieved 25 October 2013. ^ Saeed Kamali Dehghan. "It is time Rouhani broke his silence on human rights abuses in Iran". The Guardian. ^ "مشروح/ در مراسم تودیع و معارفۀ وزرای کشور روحانی: معجزه‌گر نیستم/ به استفاده از یک جناح در کابینه اعتقاد ندارم". Fars News. Retrieved 25 October 2013. ^ "Breaking Through the Iron Ceiling: Iran's New Government and the Hopes of the Iranian Women's Movements". AWID. 13 September 2013. Archived from the original on 3 October 2013. Retrieved 25 October 2013. ^ Rana Rahimpour (18 September 2013). "Iran: Nasrin Sotoudeh 'among freed political prisoners'". BBC. Retrieved 25 October 2013. ^ "Iran's president attacks Cameron's 'unacceptable' remarks as woman faces execution". The Telegraph. 30 September 2014. Retrieved 10 June 2015. ^ "Iran's Ebadi criticizes Rouhani's rights record". yahoo.com. 6 November 2013. Retrieved 1 April 2014. ^ Ebadi Criticizes Rohani's Rights Record Radio Free Europe/Radio Liberty. ^ CONOR GAFFEY (11 November 2015). "IRAN APPOINTS FIRST FEMALE AMBASSADOR SINCE 1979 ISLAMIC REVOLUTION". Newsweek. Retrieved 10 January 2017. ^ "First ever Sunni diplomat named Iran ambassador to Hanoi". IRNA. 16 September 2015. Retrieved 2 January 2017. ^ Malashenko, Alexey (27 June 2013). "How Much Can Iran's Foreign Policy Change After Rowhani's Victory?". Carnegie Endowment for International Peace. Archived from the original on 9 November 2013. Retrieved 7 November 2013. ^ Carol Morello (26 March 2015). "Final make-or-break moment for Iran nuclear talks". The Washington Post. ^ "Leaders of UK and Iran meet for first time since 1979 Islamic revolution". The Guardian. 24 September 2014. Retrieved 21 April 2015. ^ "Britain Iran resume Diplomatic Ties as Iranian Embassy restored in London". news.biharprabha.com. Indo-Asian News Service. Retrieved 21 February 2014. ^ "British embassy in Tehran reopens four years after closure". BBC News. Retrieved 10 September 2015. ^ a b c d Marcus George (28 September 2013). "Iranians cheer, protest over Rouhani's historic phone call with Obama". Dubai. Reuters. Retrieved 30 September 2013. ^ "Iran's Rouhani slams 'hegemonic' U.S. over Venezuela". Reuters. 2 February 2019. ^ "Iran's new president: Will he make a difference?". The Economist. 22 June 2013. Retrieved 3 November 2013. ^ "Iran's Rohani hopes all will seize chance of friendly ties". Reuters. 17 June 2013. ^ "President Rouhani: Iran to Stand beside Iraq in War on Terrorism". Fars News Agency. 18 December 2014. Retrieved 29 April 2015. ^ Gomes Guimarães, Bruno; Scalabrin Müller, Marcelo (9 December 2014). "Iran Joins ISIS Fight". The Diplomat. Retrieved 21 April 2015. ^ "Could Iran's elite military force defeat ISIL?". Al Jazeera. 18 March 2015. Retrieved 21 April 2015. ^ "Former Iran Nuclear Negotiator: Bush Negotiation Bid Was Rebuffed". PBS. 12 May 2012. Retrieved 20 June 2013. ^ a b c "Poll: Rouhani Approval Rating Improves". The Iran Primer. United States Institute of Peace. 2 September 2015. Retrieved 24 May 2016. ^ Jasmin Ramsey (9 September 2015). "The Nuclear Deal Was A Win for Rouhani. But Iranians Have High Expectations". Lobelog. Retrieved 24 May 2016. ^ Barbara Slavin (25 February 2016). "Poll predicts big turnout for Iran elections". Al-Monitor. Archived from the original on 4 July 2016. Retrieved 24 May 2016. ^ "Iranian Presidential Election 2017 Pre-election National Opinion Polls (April 2017)" (PDF). IranPoll.com. April 2017. Retrieved 18 April 2017. ^ Torbati, Yeganeh (29 June 2013). "Iran's Rouhani hints will balance hardliner, reformist demands". Reuters. ^ "Profile: Hassan Rouhani, President of Iran". BBC World News. Retrieved 20 May 2017. ^ a b "همسران رؤسای جمهور ایران چه کسانی هستند؟". Khabar Online. 13 July 2013. Retrieved 25 July 2013. ^ پاسخ سیاستمداران ایرانی به يك سؤال خصوصي؛ همسر خود را چگونه انتخاب كرديد؟ [Iranian politicians answer a personal question; how did you choose your spouse?] (in Persian). Young Journalists Club. 28 September 2012. ^ کاندیداها و فرزندانشان +تصاویر [Candidates and their children+Images]. Mashregh News (in Persian). 24 May 2013. ^ "Hassan Rouhani, 'ultimate insider' who holds key to a more moderate Iran". The Guardian. 20 June 2013. Retrieved 26 August 2013. ^ "Hassan Rohani: Iran's president-elect". Financial Times. 21 June 2013. Retrieved 29 August 2013. ^ "Son's suicide is Rohani's dark secret". Ynet news. Retrieved 18 June 2013. ^ "Rouhani's election". United Press International. Retrieved 2 July 2013. ^ Avni, Benny (20 June 2013). "Damning Suicide Note to Iran's New Prez". New York Post. Archived from the original on 7 March 2016. Retrieved 18 July 2016. ^ Blum, Ruthie (1 March 2016). "No New Dawn in Iran". Algemeiner Journal. Algemeiner.com. Archived from the original on 28 May 2016. Retrieved 18 July 2016. ^ کارنامۀ نامزدهای ریاست‌جمهوری، حسن فریدون روحانی [The score card of presidential candidates, Hassan Feridon Rouhani] (in Persian). Enghelabe-Eslami.com. May 2013. ^ در خانۀ هاشمی رفسنجانی چه می‌گذرد؟ داستان تكان‌دهندۀ دكتر هوشنگ بوذری در گفت‌وگو با شهروند (in Persian). 11 June 2005. ^ زمان مناظره‌های اقتصادی [The timing of economical debates] (in Persian). 30 May 2013. ^ Akbar Hashemi Rafsanjani (15 May 1982). شنبه ۲۵ اردیبهشت ۱۳۶۱. پس از بحران (in Persian). Archived from the original on 17 June 2013. ^ Akbar Hashemi Rafsanjani (31 March 1984). تأکید هاشمی برای عدالت و قانون در انتخابات/ گلایۀ همسر شهید مطهری از صداوسیما. به‌سوی سرنوشت (in Persian). "Hassan Rouhani collected news and commentary". The Guardian.